In case you weren’t aware, January in Montreal signals the launch of the upcoming theatre season, in all of its glory, as well as an impressive amount of performing arts festivals. 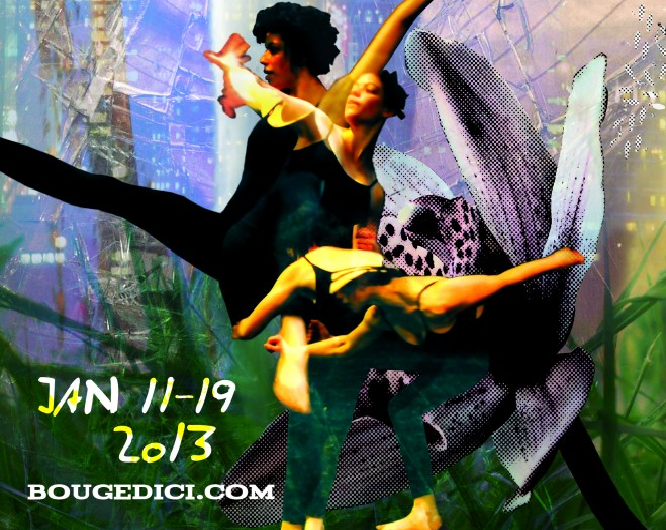 On deck this week is Bouge d’ici, a local contemporary dance festival that is being hosted at MainLine Theatre from Jan. 11 to Jan. 19. Amy Blackmore, the artistic director of the festival, an ex-Concordia student and one of the founders of the festival, explained that back in 2008, while she was still a dance student at the university, she was frustrated with the lack of opportunities being offered to students to showcase their work. As a result, she and eight of her choreographer friends set out to make opportunities of their own. The first edition of the festival was held at Ctrl Lab, the tiny (yet infamous, considering how many Montreal artists have débuted there) gallery space on St-Laurent St. that closed down last year. That first year there was barely enough seating space for 35 people and it was a Concordia-centric event. Three years later, Bouge d’ici is on to its fourth edition and is welcoming participants from a variety of institutions, such as UQÀM, École supérieure de ballet du Québec and Tangente. The choice of venue is not a coincidence. Blackmore explains that they were looking for a venue that wouldn’t be so “institutional-like,” a more relaxed atmosphere than the one that traditionally accompanies the kind of dance show that you might see at Place des Arts, for example. “We want people to come and enjoy a show that’s affordable. Come to MainLine, have a beer, relax and just have a good time,” said Blackmore. Bouge d’ici’s most popular show is Common Space and it’s the very core of the festival. The premise of the show is to pair together mentor choreographers and dancers, rendering the festival not only an opportunity to showcase potential, but also an opportunity to grow and learn. This year’s edition will showcase 11 choreographers, with 10 minutes allocated to each one’s performance. Last year Common Space sold out at all four showings. They’ve decided to add a fifth show this year and in doing so, they hope to increase their turn out. Choreographers participating in Common Space are: Kerwin Barrington, Laura Jayne Battcock, Audrey Bergeron, Patricia Gagnon, Marie-Andrée Gelac, Michaela Gerussi, Heather Lynn Macdonald, Axelle Munezero et Martine Bruneau, Auja Ragnarsdottir, et Julie Tymchuk.